From Santa Fe, take Hwy 84/285 to Espanola. In Espanola, take Hwy 68 toward Taos. Continue through Embudo and Dixon along the river, into Pilar. Note the Rio Grande Visitor's Center on the right, and the Pilar Yacht Club on the left approximately 1/4 mile North of the Visitor's Center. Have you ever been whitewater rafting and seen the kayakers having all the fun? Do you enjoy kayaking on calm water and want to try something more challenging? Do you enjoy exciting, thrill-seeking adventures, but are concerned about safety and want to learn the right technique? Do you enjoy other outdoor activities like skiing, snowboarding, climbing or mountain biking? If so, this Whitewater Kayaking Made Easy 2-day Weekend clinic is just for you! Learn the timing and placement of your strokes for maximum speed, power and stability! How to calibrate your skills so you know when you're ready for the next step! Know how to put you kayak within inches of where you want to be, with confidence, courage and control. Know when you have the skills to move on to more challenging whitewater by calibrating and testing your skills at each level along the way. Know how to make hard class III-IV moves on easy class II rapids, where there is only class II risk. The price of this clinic includes instruction and equipment, including kayaks, paddles, PFDs, skirts and helmets. A limited number of wet suits are available in cooler months. The price does not include lodging, meals or transportation. 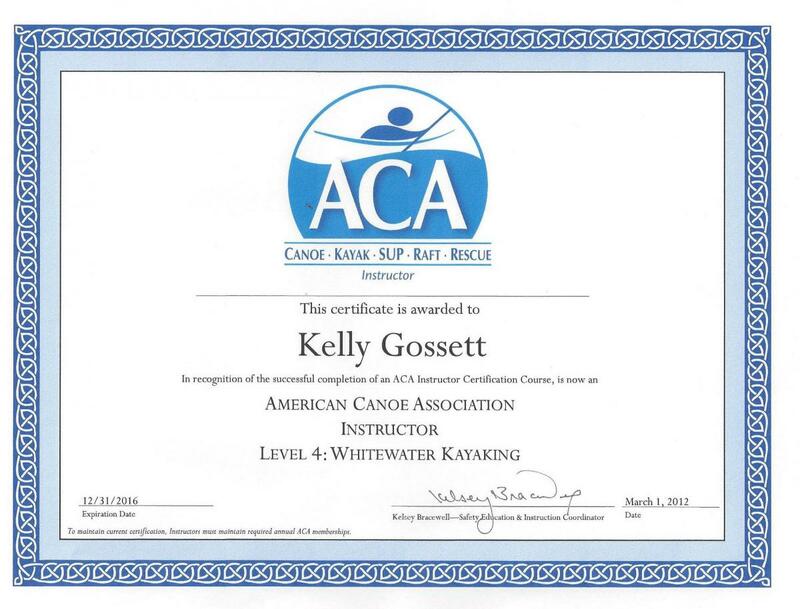 Introduction to Kayaking (level 1) or "Level 1 (or 2) Assessment" from another ACA certified instructor. Note: Level 2 is not required for Level 3, but may be beneficial for those wanting to start out at a slower pace, or for those simply interested in recreational kayaking. Your payment is a reservation for an event with limited capacity. Cancellations or rescheduling request 4 or more days before the scheduled event are entitled to receive a refund, less an $80 cancellation fee. We're sorry, but cancellations or no-shows within 3 days of the event are non-refundable, and non-transferrable. The combination of classroom, followed by river work was perfect. The schedule was flexible to deal with the reality of conducting a class outdoors. The whole experience has been informative and has helped improve my paddleing significantly. I am more likely to continue to boat on a regular basis as a result of my experience in NMKI courses. My learning curve has been exponential. I never imagined I would learn this much, so fast! Can you recommend any places to stay, besides the campground? There are a few Bed & Breakfast inns in the area. The one I recommend is Casa Escondida. Please let us know when your check is in the mail so we can be looking for it. Classes are booked on a first-paid, first-reserved basis, so mail your checks early, or call 505-217-2187 to pay by credit card. How does the Non-refundable deposit work? The non-refundable deposit goes to reserve your spot and cover certain fixed cost, like pool rental, insurance and assistant instructors. It's a two-way guarantee that you will do your best to attend, and that I will save a spot for you, provide you with a properly fitted kayak, and provide assistant instructors as needed, to keep the Student to Instructor ratio in check. If you cannot attend, try to find someone who can take your spot, and work the deposit out between the two of you. They should contact me as soon as possible to ensure space is avaialble, and provide me with their height and weight, so I can bring the right sized kayak. If, and only if, a class is full, can the deposit be refunded, or transferred to a different date. I'm a novice kayaker and really want to learn. Where is the best place to begin? The Intro to Kayak clinic is the foundation for everything I teach. It's a required prerequisite for the 2-day Whitewater Weekend clinics and the 2-day Touring Kayak Weekend clinics. The Kayak Roll is a good next step after the Intro to Kayak clinic, although not a requirement for the Whitewater or Touring Kayak Weekend clinics. While learning to roll is a good skill, it's not the best place to start. Rolling is a defensive measure. Good boat control, judgement and an accurate assessment of your skills will keep you from rolling most of the time. You'll learn boat control in the Intro to Kayak and subsequent clinics. Those who complete the Intro to Kayak class have a much higher success rate in the Kayak Roll clinic. A few hours in the boat learning to do smooth and controlled wet exits from a skirted kayak will be money well spent. If you've spent little or no time in a decked kayak, your mind will simply be too distracted by flipping over and getting out to learn the Kayak Roll. I'm afraid of flipping over. Do we have to do this? Flipping in a kayak (or "falling over") is part of the learning process, especially for beginners. Like learning to walk, ride a bike, or snowboard - falling happens from time to time. As our skills improve, frequency that we flip or fall, will be few and far between. First, we should become comfortable doing a "wet exit" when it's upside down. This is covered at length in the "Intro to Kayak" class, and briefly in the "Kayak Roll" class; each in an indoor, heated pool. The Wet Exit is incredibly simple and easy to do, and I'll demonstrate this procedure first, and will stand beside each person as they do it a few times. It's very easy for the instructor to roll you back over, for the added assurance that you'll be OK. It should get easier and easier, so that you're no longer afraid. The "Kayak Roll" (or 'Eskimo Roll') is demonstrated a few tims in the "Intro to Kayak" class, but is beyond the scope of the 'Intro' class, thus is not formally taught. To learn the Kayak Roll, check out the Kayak Roll class. By practicing these skills, using good judgement and managing certain risk, we should be over-prepared for most adventures on flat water. Is the water cold? What do I need to bring? I'll have a variety of 'farmer john' unisex wet suits, which should fit most people. If you have a wet suit that fits, please bring it. Additionally, I recommend bringing a few of your own layers; fleece vest or jacket (that can get wet), polypropylene shirt, nylon trekking pants, Lycra spandex tights, mountain bike shorts, and a good waterproof wind breaker, just in case. Anything that is fast drying, moisture-wicking and insulating is good. It's not necessary to have ALL of that, but the more options you have, the more prepared you'll be for different conditions. It also helps to have a second change of clothes for Sunday morning....just in case your clothes don't dry out overnight. You'll also need good river shoes; something that covers the whole foot, below the ankle. No sandals, flip-flops, crocks or clogs. You'll also want a shoe with a low-profile sole. Shoes like Teva's and Chacos that have a trail-running sole are often too large to fit inside a low-volume modern whitewater kayak. Dive booties also work great. When it comes to lodging, I let everyone decide what works best for them. Some people like to stay in hotels in Taos. Others like to cut cost by camping out at the Orilla Verde State Park. Others bring camper trailers and RVs. In the past, some have stayed at Ojo Caliente, Sipapu, or found Bed & Breakfast inns in Dixon, Pilar, Embudo or Chimayo. There are a variety of options. I will typically will get a campsite on the State Park Friday or Saturday night, depending on when I arrive. Campsites are booked first come, first served, so advanced reservations are not allowed. Anyone is welcome to stay at my campsite, provided we don't exceed the limits. Campsites at the Orilla Verde State Park vary from primitive to full RV setups. Most have enzyme or flush toilets, and one campground has hot showers. Bring $2-3 in quarters. It's not necessary to stay at that campground to use their shower. If you camp out, bring the usual car-camping equipment; tent, sleeping bag, mattress/sleeping pad, ice chest, etc. Plan on bringing breakfast, lunch and dinner, as there are few eating places in close proximity to the river and campgrounds. The Pilar Yacht Club is the exception. The Yacht Club makes a mean breakfast burrito, and has other basic conveniences; coffee, sodas, ice, sun screen and ice cream. The Yacht Club closes by mid-afternoon. We'll pause for about 30 minutes during our lesson for lunch, but will not have time to leave the area. At the end of an awesome day, we typically have a pot-luck dinner Saturday night at the campground. Bring a dish that can be shared with everyone. Other options include going to Taos for dinner, or eating at Embudo Station or Sugars BBQ, both about 20 minutes away from the campground.